Each ml eliminates 1 ppm phosphate in 4 US-gallons of water (250 ml treats 1,000 US-gal). 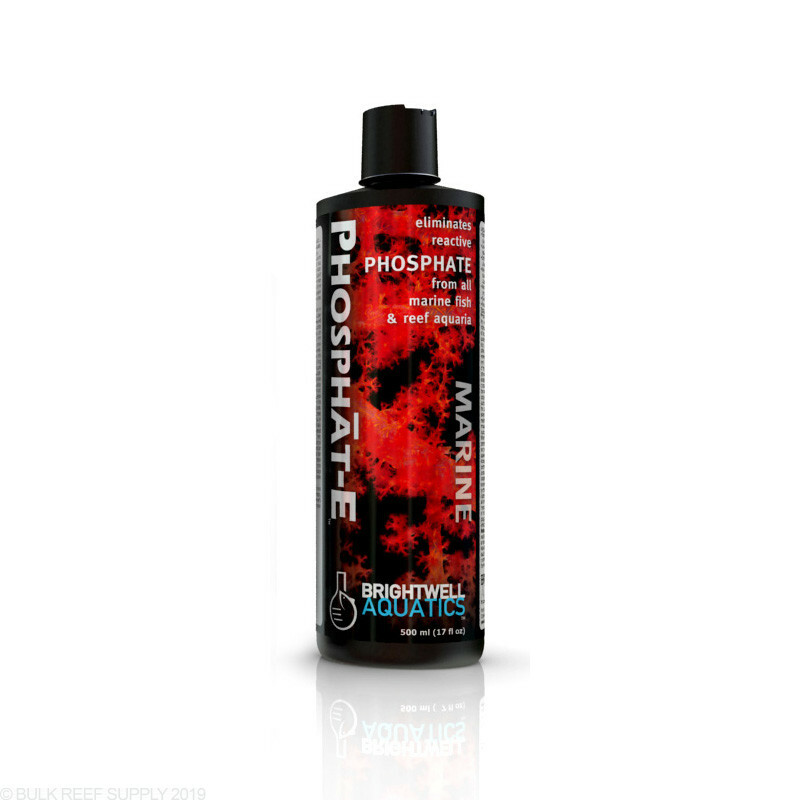 Helps facilitate the removal of phosphate from aquaria during periods when dissolvedorganic material is abundant. Advanced: Determine phosphate concentration in aquarium prior to first use by testing with an accurate test kit. Each ml of Brightwell Aquatics Phosphāt-E will eliminate 1 ppm of reactive (available) phosphate in 4 US-gallons (15.142 L) of water. The result is an inert particulate that is permanently removed from the aquarium via mechanical filtration and protein skimming. To maximize the rate of phosphate removal, Phosphāt-E should be added to the aquarium near the intake of a mechanical filter or protein skimmer. Doing so will enable the inert particulate phosphate compound to be effectively removed from the aquarium. Particulate material not removed by filtration will remain inert and the bound phosphate non-reactive indefinitely under normal aquarium conditions. The maximum dosage should not exceed 1 ml per 4 US-gallons (15.142 L) daily, as too rapid a decrease in the concentration of phosphate may irritate sensitive corals, particularly if the phosphate concentration has existed at a relatively-high level for an extended period of time (e.g. 3 - 6 weeks). The concentration of available phosphate in marine aquaria should not be allowed to exceed 0.05 ppm for any lengthy period of time; available phosphate in the presence of other substances can indirectly negatively impact the appearance of an otherwise beautiful marine aquarium. If corals or other invertebrates appear to react negatively to the addition of the product, it may be an indication that reactive phosphate is being removed too aggressively; decrease dosage by 50% and continue treatment until phosphate concentration appears to be immeasurable. Ingredients: Purified water, proprietary phosphate removers. I dosed PO4 to outcompete dinoflagellates with green algae. I overdosed by miscalculation over a month ago and have been doing water changes and adding GFO nonstop and the PO4 levels remained above 2.5 which is the highest my Hanna checker goes. I added 60 ml to my 250 gallons of water and sure enough, 12 hours later .77 was my PO4 reading. I am very happy with this product and it is much cheaper than GFO will less hassle. I am wondering if I should order a bottle and keep it on hand in case of emergencies. What is the shelf life of this product? Thank you for reaching out to Bulk Reef Supply! The Brightwell Phosphat-E - Liquid Phosphate Remover does have a shelf life of a couple years. I hope this was helpful. Please reach back out if you have any further questions!